There’s a couple big pieces of news for Now Playing Podcast listeners! First, the movie Kingsman: The Golden Circle is now available through Video on Demand, and its Blu-Ray release is set for December 12. To coincide with this release, Stuart, Arnie, and Jakob’s review of the second Kingsman film will be released on our main podcast feed! This review was broadcast live back in September when the movie was new in theaters and listeners have been anticipating the release of the edited show. Wait no more…it will be tomorrow–November 30! Hear the unedited audio from our first live review of Kingsman: The Secret Service from February 2015! Including the listener chat after the show! Watch the review of Kingsman: The Golden Circle! We broadcast that review as live split-screen video. On this DVD-ROM set you will get a nicely edited version of that review–PLUS the Q&A done with listeners after that show! Plus, if you pre-order the DVD-ROM set you can be on it! This Sunday all the Now Playing hosts (Arnie, Marjorie, Brock, Stuart, Jakob, Jerry, and Justin) will be getting together for a no-holds-barred conversation. This recording will be exclusive to this DVD set.Anyone who orders the set by the end of Saturday, December 2nd can submit a question either through e-mail, MP3, or iPhone Voice Memo, and it will be answered by the team! If you send MP3 or the Voice Memo, YOUR voice will be immortalized in this celebratory event! See all the details at our donation page! And the 5th Anniversary DVD-ROM set is also available! 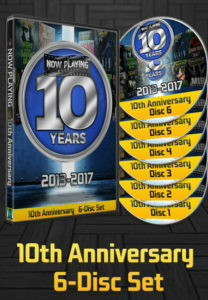 If you order both (even if you ordered the 5th Anniversary disc previously) you also get the free bonus Now Peaking DVD-ROM set! So we hope you enjoy tomorrow’s free bonus review, Friday’s review of Hellraiser: Inferno, and all the shows we have coming up!